Our Gent's Accessory Case represents the ultimate in practicality and considered design. 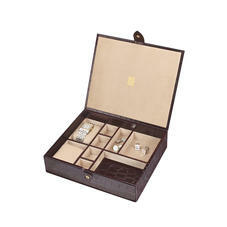 Each case features two watch rolls, six versatile compartments for smaller items and a sloping tidy tray. Handcrafted from lavish Italian calf leather, the soft, contrasting suede lining will protect your most prized accessories and the snap-close lid offers further security. Discover a choice of luxe Amazon brown and timeless black and add initials for personalised finesse. The Aspinal Gents Accessory Case measures 10.3" x 8.9" x 2.5" inches and is covered in mock croc Italian calf leather and lined in signature contrasting Cobalt soft suede. 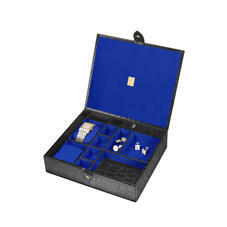 There are two watch rolls, 6 smaller cubicles for cufflinks and rings with a sloping tidy tray for coins, keys and those little 'bits and pieces'. The case opens and closes with secured leather tab fastener. This wonderfully hand made accessory case provides gents with all they need to store their most valuable personal belongings whilst also providing a handy tidy tray for the dressing table. Can be personalised with initials.